As soon as Donald Trump declared or announced Jerusalem as the capital of Israel; Islamic nations went crazy, Muslims began to murmur and seek where to heap their frustrations. We all know Islam and how Muslims can be when their purported holiness is dared. Israel remains the eternal enemy of Islamic nations; history has made it so. Long after they scattered and strangers occupied the city of David, in 1948; Israel finally stood and fought all Islamic nations and won them shortly after Jewish state was restored. While Islamic nations were still suffering such huge defeat and the loss of occupied west Jerusalem; in 1967, Israel struck again and took over East Jerusalem from Jordan. That completed a flawless victory and placed Israel above all Islamic nations. Israel will forever be their enemy and the sword shall continue to be in the house of Israel. In the absence of what you think; Israel is the home of Christian and Jewish religion, it is the foundation of that holy book called Bible. No matter how New Testament or version of the Bible may have abused the Bible itself; the history written or recorded therein (Old Testament) remains intact and the prophecies contained therein everyday comes to reality except the prophecy contained in the Roman pioneered New Testament. The foundation of the God of Abraham, Jacob, Moses, Elijah, David, Solomon etc is on Israel and everything surrounding it. That is what the declaration by Donald Trump means; a fulfillment of a biblical prophecy, no wonder everything was against Donald Trump and he yet won the seat of the American presidency, did God placed him there for the fulfillment of prophecies? I took my time to reflect what happened in Denmark years back; to Muslims, Prophet Muhammad statue was blasphemously sculptured in Denmark ‘by Rochas Okorocha’ and Nigerian Muslims took to the streets and started killing Nigerian Christians. Let me remind you that once Christianity in mentioned in Nigeria; the people of Biafra are the Christians in context. So if Christians were killed for the sake of a sculpture in Denmark; what stopped the same killers from killing Christians again in Nigeria, now a Christian in the White House gave its purported holiest site to supposed infidels? How come they did not even kill one Christian again in Nigeria but chose to carry placards; when not only Muhammad was blasphemed but the supposed shrine of Muhammad will henceforth be Israeli capital? That brings Nnamdi Kanu into the picture; Biafra agitation championed by Nnamdi Kanu has absolutely tamed Nigerian Muslims. I read in the news that Nigerian Muslims protested against recognition of Israel and I asked, when did they learn how to protest and what happened to their orthodox bloodshed? Biafra agitation championed by Nnamdi Kanu has brought Nigeria to the red line and knowing that it will not be business as usual if they kill the people of Biafra or Christians in the name of Jerusalem, they decided to maintain their cool and contained their frustrations over Israel. They are now very much aware that this is not the time of Ohaneze, time of those stooges called governors, time of those fake Biafra agitators, the likes of Uwazurike and his cohorts. They are now very much aware that the agitation under Nnamdi Kanu is capable of protecting and fighting for the people of Biafra and Christians at large. The political and religious classes that incite those Almajiris to kill and maim in the name of fighting for Allah know now that days of free killing are gone. They are now aware that Nnamdi Kanu has sensitized the people of Biafra and questions will follow any action they take. They are now aware that Nigeria is sitting on a keg of gun powder and any action will be simultaneously balanced. Now they know that the people of Biafra are serious and mean business. Now they know that love has been restored into the lives of the people of Biafra. They now know that a single Biafran life matters to millions of the people of Biafra scattered all over the world and they have been curtailed. Let me finally remind Nigerian Muslims that the people of Biafra are focused and waiting for them; a Christian life today matters in Nigeria, especially indigenous Biafran Christian. They can protest all they care; pull down the gates of Israeli embassy in Abuja. The people will support them if that is the lesson they have learned from Nnamdi Kanu. But the lesson of killing our people they learned from Ohaneze, governors and politicians, they should be mindful because the people will respond if they go back to such lesson. Like Nnamdi Kanu or hate him; he has proven not to be only the leader of the people of Biafra but a rock that has taught Nigerians lesson. 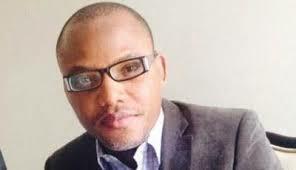 He has proven to be the fear factor of the people of Biafra and Christians at large. He has tamed wild animals in Nigeria and blood sucking politicians and Ohaneze Ndigbo. He has restored the dignity and pride of the people of Biafra; wherever he is today, in detention or death, honour and love will forever remain with him. Oya na, Aboki, Biafran Christians full your area, make una start slaughtering because Jerusalem don go forever o!